It's been a great collaboration. 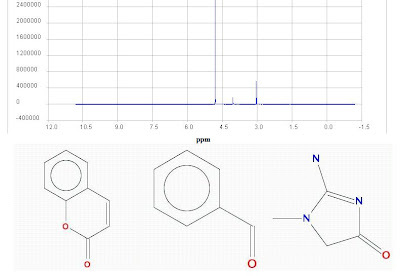 I think the new structure images look better and with the new spectra we have added and made accessible via the web service it looks very slick! I still think your spec game can be a powerfull tool in teaching and I will point it out to my students. 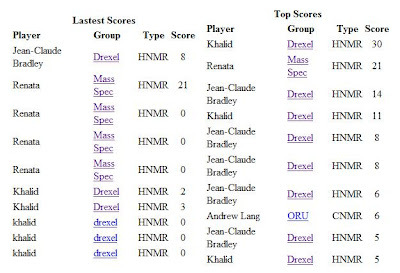 1.I assume that the spectra-structure associations come out correct and the unexpected appearance of the score list must be due to either a poor choise ,indeed, or due to the spectrum itself been poorly presented or even missleading. the non uniform format of stuctures especially those involving stereochemistry variables. he/she has done wrong how is he supposed to comment postmortem on anything or even convince himself that there was indeed a better structure to klick upon! 2.Could the library be enriched with simpler structures raising clearcut NMR issues like 1ntensity ratios multiplicities etc? 3.Could there be some progression in dificulty apart from the number of alternative structures? because I am not in informatics and cannot appreciate what is involved. I am thinking of submitting some spectra my self and will attempt to do so when I find out how exactly. K - thanks for your feedback. If an aldehyde peak is missing or there some other problem with the spectrum please leave a comment and we'll deal with it. You can hit the back button after getting kicked out to leave a comment.